Showing 14 articles from May 4, 2015. The Winlock Farmer's Market will be open for special Mother's Day hours this Wednesday to allow extra time for gift shopping. Normally open every Wednesday from 9 a.m. to 3 p.m., the market will be extending their closing time to 6:30 p.m. this week and interested shoppers and vendors are invited to participate. 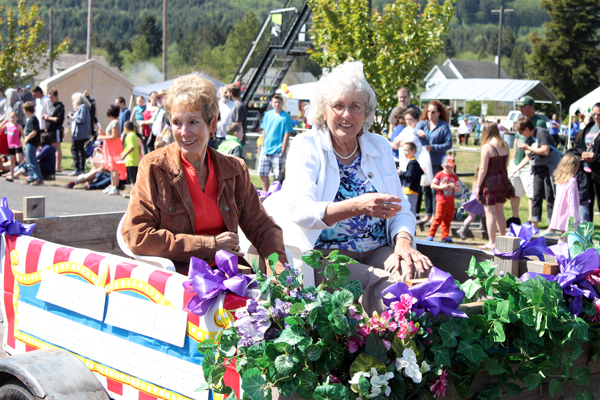 Grand Marshals Pegge Baher (left) and Lois Wilson (right) wave to the crowd during May Day last Saturday in Vader. The city was abuzz with local residents coming to take part in the first of Lewis County's summer festivals, with many noting more excitement felt this year than in the past. It's a little more than a week before the Arts & Crafts Fair on May 15 & 16. It promises to be the biggest and best one yet! It seems everyone is preparing for it. I know I am. As usual, the two large rooms of Community Hall will be full to the brim and "Grandma's Kitchen" Bake Sale will be in the kitchen of Community Hall. 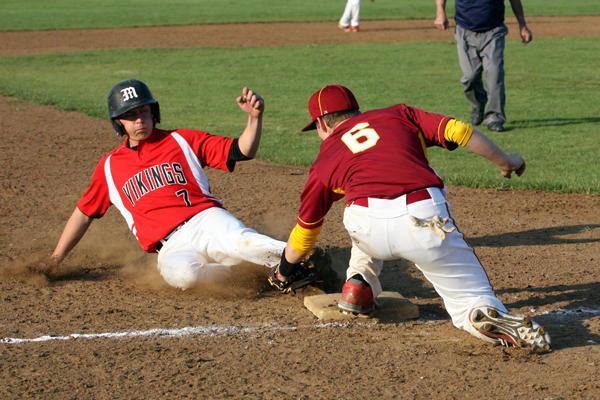 May 7 Blood Drive 10 a.m. - 3 p.m. at Toledo High School. Time remains to participate in the Country Cruisers Car Club's next car show on June 6 at McMurphy Park. The entry fee is $15, with options for finished or unfinished vehicles and more than one entry per person. For more information, call Club President Al Bangs at (360) 827-1899. This Thursday will be the second and last workshop to help explain the current grant opportunity for qualifying residents to have their side sewers replaced for free. The city is seeking to reduce the leaks in their sewer system and has acquired a grant available to residents (renters or homeowners) with low-to-moderate income levels. The workshop will be held 5 to 7 p.m. at City Hall and those with questions are encouraged to call (360) 295-3222. If you missed last month's BIG Community Meeting, you can watch the video online at www.visionToledo.org. At the Toledo Community Library, Adult and Kids Page Turner reading groups are starting soon. TCL will host a tea party on May 9, and in June the Reptile Man is coming to Toledo. Mothers Day is right around the corner, take the time to thank all the Mothers in your family. It is the day that all Mothers appreciate a thank you for all they have done. Winlock Olequa Senior Center would like to thank the community for participating in dinner on May 1. It was a great success! On behalf of the May Day Event Organizers we would like to say "Thank you " to everyone for another eventful year. To vendors, The Little Crane, the zip line and water bubble, Fire department, dancers, all local Police departments, Vader Assembly of God for sound system, parade entries, all who donated cakes, Luck Eagle for raffle items and Doug & Bonnie McGinnis for their long time support we could not do this without you all!!! The United Soccer team earned two more victories last week with a 5-1 win over King's Way Christian and a 7-1 triumph over Seton Catholic. United hosts advisory White Salmon this week but had already won the league title after going nine games without a defeat. A plea deal appears to be on the table for a Vader woman accused of causing the death of a young boy last fall, as a hearing to confirm details of her trial has been rescheduled twice amid negotiations between attorneys. Brenda Wing, 27, appeared in court Monday for an omnibus hearing on charges related to the death of 3-year-old Jasper Henderling-Warner, who was found unresponsive at Wing's residence Oct. 5, 2014, and was later found to have died from ongoing physical abuse. Authorities are seeking help investigating the theft of a boat and trailer from the Salkum area earlier this year. Sometime between Feb. 23 and April 9, an unknown number of suspects stole a 19-foot Alumaweld boat and trailer from the area of Spencer Rd. and Brim Rd., near Salkum. The boat was later recovered in Mason County, however both motors had been removed, and the estimated loss is $10,000. Local fire and EMS calls between April 27 and May 3. The City of Winlock has scheduled a public meeting for May 20 to discuss possible options for police services in anticipation of Police Chief Terry Williams retiring June 30. Scheduled to begin at 6 p.m. in the Community Building, city leaders are seeking input from the public regarding multiple options including hiring a new chief, contracting for the services of a chief and hiring a patrol officer, or contracting for all police coverage. A Winlock man has been arrested for allegedly holding a former girlfriend captive for a week, according to the Lewis County Sheriff's Office. Bruce W. Finney, 46, of Winlock was contacted April 30 after the victim told authorities Finney had abducted her April 22 while she was walking to the store and held her against her will for a week at his home and would assault her during attempts to leave. On April 29, the subject allegedly told the victim she could leave, but became upset afterward and began choking her until she could not breathe.